TORU control station, exhibited at the Russian Pavilion, Hannover Expo 2000. Mir Expedition EO-23. Mission was an endless series of collisions, breakdowns, fires, and other emergencies. The Soyuz landing rockets failed to fire on touchdown, giving one of the roughest landings experienced by a returning Mir crew. AKA: Mir EO-23;Sirius (Sirius);Soyuz TM-25 (Lazutkin, Tsibliyev). Launched: 1997-02-10. Returned: 1997-08-14. Number crew: 2 . Duration: 184.92 days. Soyuz TM-25 docked with Mir at the forward port on February 12 at 15:51:13 GMT. On August 14 the EO-23 crew handed over the station to their replacements and landed in Kazakhstan at 12:17 UTC, 170 km SE of Dzhezkazgan. RKK Energia's 7K-STM spacecraft No. 74 was launched as Soyuz TM-25. On Feb 11 the orbit was 262 x 311 km x 51.65 deg, while Mir was in a 378 x 394 km x 51.65 deg orbit. The Soyuz carried the EO-23 Mir crew together with German astronaut Reinhold Ewald. After several rendezvous burns, the Soyuz docked with Mir at the -X port on Feb 12 at 15:51:13 GMT. The subsequent disaster-filled six month mission included on-board fires, power losses, oxygen system problems, thermal control problems, station control system failures, cabin depressurizations, and the collision of the Progress 24 with the station. The EO-23 crew's problems began on Feb 23 at 19:35 GMT when a fire broke out in a lithium perchlorate cartridge in the Kvant module used to generate extra oxygen on Mir. The fire lasted 14 minutes and meter-long flames of burning lithium perchlorate in the Kvant module blocked the way to one of the two Soyuz spaceships. EO-22 crew members Korzun and Kaleri used extinguishers to fight the fire; the crew wore gas masks for two and a half hours afterwards due to the heavy smoke in the station. This was followed in March by continuous problems with the various oxygen-generating, station control, and thermal control systems. The carbon dioxide removal system failed on April 3. The Progress M-34 supply ship brought much-needed repair equipment for the oxygen systems in the second week of April. Vasiliy Tsibliev and visiting American astronaut Jerry Linenger donned Orlan-DM spacesuits and made a 4h 57m spacewalk on April 29. They left the airlock at 05:10 GMT and returned to Kvant-2 at 10:08 GMT. The astronauts retrieved some sample collection experiments from the outside of the complex. Flight engineer Aleksandr Lazutkin remained inside the Mir complex. The robot cargo ship Progress M-34 undocked from Mir at 1022 GMT on June 24 to perform a redocking test using recently developed remote-control procedures which are replacing the old automatic systems that Russia can no longer afford to buy from Ukraine. At 09:10 GMT on June 25, Mir commander Tsibliev was remotely commanding the approach of Progress to the Kvant (37KE) module when the Progress went off course and collided with a solar array on the Spektr module and then the module itself. A large hole was made in the solar panel, and one of Spektr's radiators was badly buckled. A small breach in Spektr's hull appears to have been made and the module began to depressurize. This was not a slow leak - the crew heard a hissing sound and felt their ears pop. They closed the hatch on the core module transfer section that leads to Spektr by 09:38 GMT. The Spektr module was thereafter fully depressurized. It remains docked to Mir with its docking hatch open. The electrical connection between Spektr's solar panels and the main station was broken off, also cutting off the power supply from the solar panels on the Kristall module. Tsibliev was also driving on the only previous documented orbital fender-bender, when he banged Soyuz TM-17 into Mir in January 1994. Mir lost power and attitude control on July 16 when a cable was accidentally disconnected, but the crew were able to use the Soyuz to reorient the station and restore the situation. The spacewalk to reconnect the Spektr power cables was delayed until the next Soyuz launch. This was reoriented to concentrate on repairing the station and getting it back into operation. Researcher Leopold Eyharts of France's CNES was bumped from the crew and rescheduled for a 1998 flight. The EO-23 handed over the station and on August 14 entered their Soyuz TM-25 transport ship, closing the hatches at 05:50 GMT. Soyuz TM-25 undocked from the Mir forward port on August 14 at 08:55 GMT and at 11:22 GMT fired the deorbit engine on the PAO (priborno-agregatniy otsek, equipment-service module). The PAO and the BO (bitovoy otsek, living module) separated from the SA (spuskaemiy apparat, descent craft) a few minutes later. The PAO and BO burned up in the atmosphere. The SA reentered, and landed in Kazakhstan at 12:17 GMT, 170 km SE of Dzhezkazgan. The Soyuz landing rockets failed to fire on touchdown, giving one of the roughest landings experienced by a returning Mir crew. Family: Manned spaceflight. People: Lazutkin, Tsibliyev. Spacecraft: Soyuz TM. 1997 February 10 - . 14:09 GMT - . Launch Site: Baikonur. Launch Complex: Baikonur LC1. LV Family: R-7. Launch Vehicle: Soyuz-U-PVB. Soyuz TM-25 - . Call Sign: Sirius (Sirius ). Crew: Ewald, Lazutkin, Tsibliyev. Backup Crew: Dezhurov, Padalka, Schlegel. Payload: Soyuz TM s/n 74. Mass: 7,250 kg (15,980 lb). Nation: Russia. Agency: RAKA. Manufacturer: Korolev bureau. Program: Mir. Class: Manned. Type: Manned spacecraft. Flight: Soyuz TM-24, Soyuz TM-25, Soyuz TM-25 Mir 97, STS-81 Mir NASA-3. Spacecraft Bus: Soyuz. Spacecraft: Soyuz TM. Duration: 184.92 days. Decay Date: 1997-08-14 . USAF Sat Cat: 24717 . COSPAR: 1997-003A. Apogee: 392 km (243 mi). Perigee: 385 km (239 mi). Inclination: 51.70 deg. Period: 92.30 min. Mir Expedition EO-23. Soyuz TM-25 docked with Mir at the forward port on February 12 at 15:51:13 GMT..
Mir News 345: Soyuz-TM25 docked at Mir-complex - . Nation: Russia. Program: Mir. Flight: Soyuz TM-24, Soyuz TM-25, Soyuz TM-25 Mir 97, STS-81 Mir NASA-3. Without significant problems Soyuz-TM25 docked at the aft (+X axis) of Mir on 12.02.97 at 15.51.13 UTC. During this operation the Russians still used the system Kurs. The automatic mode worked well from the beginning and only in a distance of 5 M. Tsibliyev had to take over manually due to a slight deviation along the X axis (roll). After some little corrections he accomplished a soft 'kasaniye' (touch). During the first pass of both objects for our position (orb. 62758) 1541-1548 UTC approach traffic could be monitored on 121.750 mc, but the full Altair-1/Mir window (1510-1618 UTC) was in use for this traffic. In fact Soyuz-TM25 used for communications with TsUP 2 relay facilities: Mir and Altair-1. In this traffic Tsibliyev and Lazutkin (Siriusy) as well as Korzon (Fregat) could be heard. The moment of the soft docking could be derived from the word 'congratulations' spoken by one of the cosmonauts. During the next pass (orb. 62759), 1720-1726 UTC, the hatch had already been opened and the pass thereafter (orb. 62760/61) the new crew was inside Mir. Communications Soyuz-TM25: 3 hours after launch on 10.2.97 (orb. 2, 1712-1714 UTC) the transmissions of the ship could be monitored on the well known frequencies with Tsibliyev on 121.750 mc with TsUP. During the next pass (1841-1848 UTC) he reported the good results of the 2 orbit corrections. He also mentioned some problems with a TV-installation or a screen. Apart from some interference by the ground services of a near by airport (also using 121.750 mc, but AM-W) the signals came in loud and clear. Also during the second day (11.02.1997) traffic could be heard during all passes for our position. Communications Mir: On 8.02.1997 DLR's GSOC in Oberpfaffenhofen (Germany) and Mir tested the direct link via the quasi-geostationary comsat Altair-1 over 16dgs West. Good images and audio from inside Mir demonstrated that the test was a great success. They also checked the performance of the so called BDD (Betriebstechnik Deutschland Direkt). This is an interface assembly for direct data exchange between specialists on earth and Reinhold Ewald during experiments in the framework of the Mir-97 program. A few days later it was clear that the direct link between GSOC and Mir will be a normal routine until 2.03.1997 (the end of Mir-97). PS: A tragic event in my family caused delay in the mailing of this report. 1997 February 22 - . Mir News 346: Mir'97 - . Nation: Russia. Program: Mir. Flight: Soyuz TM-24, Soyuz TM-25, Soyuz TM-25 Mir 97, STS-81 Mir NASA-3. Dr. Reinhold Ewald amuses himself well on board of the Mir space station. He uses as his private domain the Module Kristall (T). His American colleague Linenger has his private quarter in the Module Spektr (O). He is sleeping there , has room for personal belongings and he found a free surface on the wall to fasten some photographs. Thus far I do not know the temporary private quarters of Tsibliyev and Lazutkin. Korzun will remain in command of the complex until his departure on 2.03.1997. Ewald discusses the experiments which he has to execute during this mission with Sigmund J�hn (at TsUP) or with Hans Schlegel (in GSOC). From the radio traffic could be derived that Ewald is successfully executing the program although now and then something goes wrong. This was the case with an experiment planned for 19.02.1997: In the framework of a medical experiment he had to drink 200 ml tomato-juice with salt, but bad quality of the juice made this impossible. The experiments with the Titus-oven, the French Alice-2 installation (studies of the characteristics of liquids) and MEDEX (medical experiments) have been successfully executed thus far. Anniversaries: On 20.02.1997 Tsibliyev celebrated his 43d birthday. Exactly 11 years ago the Base block of Mir was launched. . Problems with a gyrodyne: On the eve of these anniversaries the crew had to solve a difficult problem. On 19.02.1997 during the pass in orbit 62876 (1521-1527 UTC) TsUP gave Korzun data, which had to be loaded in the system Svet for the movements control of the complex. Korzun asked what the reason was. TsUP informed him that Telemetry showed the malfunction of a gyrodyne in Kvant-2 (Module-D). In the evening and night the crews solved the problem. Communications: Contrary to the expectations the German GSOC Oberpfaffenhofen seldom uses the possibility for direct links with Mir via the (almost) geostationary Altair-1 (Cosmos-2054). Apart from the 143.625 mc, Ewald regularly uses the so called UKW-2 (VHF-2) on 130.165 mc for communications with his consultants (Sigmund J�hn) at TsUP and (Hans Schlegel) in GSOC. Now and then Linenger can be heard on that frequency with the American consultative group at TsUP . The 145.800 mc is the downlink frequency for Packet radio or phone. Mostly Korzun can be heard here. A few times Ewald uses this facility for contacts with German radio-amateurs. He uses the call sign DL2Mir. In the simplex mode he sometimes can be heard on 145.925 mc. 1997 February 24 - . Mir News 347: FIRE ON BOARD OF THE Mir-SPACE STATION - . Nation: Russia. Program: Mir. Flight: Soyuz TM-24, Soyuz TM-25, Soyuz TM-25 Mir 97, STS-81 Mir NASA-3. Radio traffic during VHF windows for our position in the morning of 24.02.1997 revealed that something serious had happened on board Mir. Somewhat earlier there was already an indication: a direct TV-link from Mir with Oberpfaffenhofen via Altair-1 for this morning did not take place. During the 3d pass for our position (orb. 62943, 1341-1348 UTC) the cloven hoof came out: in a conversation with his consultants on earth Ewald reported about a fire on board. This fire broke out last night. An oxygen cartridge caught fire and a grey smoke spread out in all parts of the complex. Korzun and Kaleri fought against the fire with extinguishers and the others tried to push back the smoke. All crew members had to wear gas-masks. This lasted two and a half hours the maximum endurance of those masks. The extinction water caused a high humidity and the temperature of the atmosphere was higher than normal. Ewald did not get smoke or just a little bit in his longs and to remain on the safe side he swallowed coal- and vitamin tablets and milk products. He was very tired but he did not think that this had been caused by something like pollution, but by the lack of sleep. He went asleep at 6 o'clock in the morning and woke up 4 hours later. Jerry Linenger was very busy collecting air samples for pollution tests. He also tried to determine the amount of formaldehyde. The crew of six was in the Base Block when the fire began in an adjacent room. Russian toxicologists are analysing telemetric data about Mir's on board atmosphere. The crew already collected urine- and saliva samples and later on they got instructions to collect blood samples and to do additional medical tests. In the course of the day a TV press conference was on schedule and a lot of journalist were waiting in Oberpfaffenhofen. Ewald told that the events had caused such a mess in the station that it was not convenient to have that TV session today. As a palliative Ewald answered some questions about the nightly occurrences and his statements almost fully confirmed the information gathered by me for this report. 1997 March 2 - . Mir News 348: Soyuz-TM24 made happy landing - . Nation: Russia. Program: Mir. Flight: Soyuz TM-24, Soyuz TM-25, Soyuz TM-25 Mir 97, STS-81 Mir NASA-3. On 2.03.1997 at 0644 UTC the return capsule of the Soyuz-TM24 made a safe landing in Kazakhstan not far from Arkalyk (47degr49min North; 69degr24min East). At abt 4 mins later the first helicopter of the search- and rescue team reached that position. The return operation and landing took place without problems. During the return operation Soyuz-TM24 communicated via the Eastern tracking stations in Russia and probably Altair-2 over 96 dgs East. Obviously Altair-1 was (or: is?) not operational. The fire in the night from 22 to 23.02 put its stamp on this last week due to the pollution of the Mir's atmosphere during the first days and the extra attention the crew had to give to the damaged oxygen-generator and cables. For a long time there was the smell caused by the fire. One of the cosmonauts spoke about the smell of 'roasted turkey'. Some crew members suffered from some irritation of the bronchia, a dry throat and sleeping problems. Nobody was hurt with the exception of Korzun who had a very small burn on his hand. Ewald had already executed the majority of the Mir'97 experiments and the events did not significantly influence that program. German project managers were satisfied about the successful results and conclusion of the mission. During this week there has been a lot of radio traffic on 2 frequencies simultaneously: the Russians used 143.625 mc and Ewald and Linenger 130.165 mc. For some planned TV sessions, i.e. for the RTL children's programme Captain Bluebear and about a contest for drawings by children with the wife of the German President Herzog they did not use the geostationary satellites but direct TV transceivers on lower frequencies. For phone during these sessions Ewald used the UKW-2 130.165 mc. Siriusses: The new crew, Tsibliyev and Lazutkin, the 23d M.E. to Mir, and Jerry Linenger will have to do a lot of work in the near future. In fact there are still a lot of experiments in the framework of Mir'97 to be done: this had been planned and this work got the designation Mir'97E, the letter 'E' standing for 'Extension'. Progress-M33: This old freighter is still flying autonomously until her 2d docking at Mir. That will take place on 4.03.97. Tsibliyev got orders to control the approach and docking manually with the remote-control system TORU. There has also been an instruction to leave Progress-M33's hatch closed after docking. Kaleri asked TsUP to consider the possibility to open the hatch and to use the still available room in the spherical part of Progress-M33 to stow stuff no longer needed: especially the considerable amount of human waste. During the long period with a crew of 6 the quantity of this increased enormously. Landing of Soyuz TM-24 - . Return Crew: Ewald, Kaleri, Korzun. Nation: Russia. Related Persons: Ewald, Kaleri, Korzun. Program: Mir. Flight: Soyuz TM-24, Soyuz TM-25, Soyuz TM-25 Mir 97, STS-81 Mir NASA-3. Korzun, Kaleri and Ewald undocked from Mir in the Soyuz TM-24 spaceship at 03:24 GMT on March 2 and landed at 06:44 GMT near Arkaylk in Kazakstan..
1997 March 4 - . Mir News 349: Set-backs - . Nation: Russia. Program: Mir. Flight: Soyuz TM-25, STS-81 Mir NASA-3. The redocking of this freighter at the Mir complex planned for 4.03.1997 at 0750 UTC did not take place. During the first pass of both objects here in Mir's orb. 63065, 0733-0739UT, radio traffic revealed that the docking was not possible. Tsibliyev reported that the Progress-M33 did not do what she had to do and that he did not have a continuous image on his screen of the approaching ship. So he was unable to aim her with the system TORU. He was able to give some commands, for instance to reduce the speed of Progress-M33. Progress-M33 passed Mir in a distance of appr. 220 - 230 Meters. The cosmonauts now and then had visual observations of the Progress-M33, but not continuously and it was difficult to determine the distances via the portholes as there were no reference points. Radio traffic during following passes confirmed the failure. Progress-M33 was flying near Mir in a distance of appr. 1 KM. A commission headed by V. Solovyov is trying to find the cause of the failure and to find a solution. Tomorrow they hope to announce if and, if so, when the second attempt will take place. At the moment Mir does not have the possibilities to communicate via Altair-1 (Cosmos-2054) and Altair-2 (Luch-1). Altair- 1 came in a so called sun-pointing attitude and is no longer under control. This happened once in the past and then the satellite restored the normal attitude itself. Whether this will be possible this time or not is not sure. Mir also cannot use the 2d geostationary satellite over 96 degrees East. The Antares transceiver for Mir's uplink to the geostationary satellites is unserviceable and has to be replaced. The Russians hope to send a new Antares to Mir by Progress-M34. So the communication situation is very poor at the moment: in fact even worse than before the deployment of Luches for Mir. In the past tracking ships filled up the gaps, but these ships are not operational now. The possibility to use American tracking stations (Wallops, White Sands and Dryden) does not give enough solace. 1997 March 7 - . Mir News 350: SITUATION ON BOARD Mir REMAINS PRECARIOUS - . Nation: Russia. Program: Mir. Flight: Soyuz TM-25, STS-81 Mir NASA-3. After the loss of one Solid Fuel Oxygen Generator in the night from 23 to 24.02 the crew has been struggling along to keep the mini-atmosphere on board of the space station suitable for the needs of human beings. On 5.03 one of the Elektrons (possibly the 2d Elektron is out of order and has to be repaired with spare parts to be delivered by the next supply ship) showed a malfunction and so the crew had to use a part of the oxygen reserved for spacewalks to bridge the period until the repair of that Electron. They managed to get this Elektron operational again in the afternoon. The crew is very busy to secure the working of the life systems and this fact can be derived from radio traffic during every possible pass. Among the additional measures to maintain a liveable situation on board a lot of air hoses have been deployed to enhance the air circulation through the whole complex. Communications: As it is not possible to communicate via the geostationary satellites every possible VHF-pass via tracking stations in Russia and the United States is fully utilised. In this way I can obtain a lot of information, but in fact this is rather poor in comparison to that what can be derived during the long sessions via Altair-1. For TV-sessions the Russians now use the direct links on lower frequencies via tracking stations. These sessions are shorter and have a rather poor quality, mostly black/white and often the accompanying speech goes via the normal VHF-downlink. Progress-M33: It has been decided not to try a second attempt to redock Progress-M33 at Mir. The Progress-M33 will be put on a destruction course on 11 or 12.03.1997 and burn up in the atmosphere over a designated area in the Pacific East of New-Zealand. Progress-M34: The Russians are still waiting for the disposal of a rocket for this launch. This certainly will not be earlier than 25.03.1997. They hope to launch the Progress-M34 on 6.04.1997. Among a lot of other supplies this Progress has to deliver a replacement for the Antares transceiver (uplink to Luches) and spare parts and materials for the repairs of the defective life support systems. Spacewalk (EVA): The Russians still hope that Tsibliyev and Linenger will be able to do an EVA. For the time being 17.04.1997 is on schedule. 1997 March 21 - . Mir News 351: Mir-routine - . Nation: Russia. Program: Mir. Flight: Soyuz TM-25, STS-81 Mir NASA-3. Gradually the passes of Mir for our area shifted to the night hours, but nevertheless a lot of radio traffic could be monitored since the last Mir-report. This traffic revealed that the only system for the production of oxygen is the solid fuel oxygen generator. The crew co-ordinates the use of the so called 'shashki' (disks) with TsUP and daily abt 3 of those 'cartridges' are 'burnt'. In the beginning they still tried to activate the only operational Elektron to generate oxygen from 'technical' water, but possibly the gas-analysers reported that the quality of the production did not reach the desired standards and they had to stop these attempts. They seem to have enough 'shashki' until the arrival of new supplies but they cannot use all available cartridges. They got orders to refrain from the use of those produced in the years after the decay of the Soviet Union. Progress-M34: The launch of this badly needed freighter is on schedule for 6.04.1997. It is not sure whether or not spare parts (filters a.s.o.) are ready before that launch. The Progress-M34 will also have to deliver a new Antares transmitter for communications via the now only available Altair (nr. 2) satellite. Communications: The present position of Altair-2 is over 94 degrees East. For docking operations of Soyuz-TM ships and shuttles, but also for the communications during EVA-s and the morale of the crew a position more to West, for instance in the slot of Altair-1 (Cosmos-2054) would be more suitable. Movements control: On 19.03.1997 during the pass in orbit 63298, Tsibliyev reported a malfunction of an Omega angular rate sensor. At 0448 UTC the SUD (movements control system) showed a failure and the complex came in an inexplicable rotation. Apart from one the gyrodynes were still working, but obviously unable to correct the stations attitude. During the next pass (in orb. 63300, 0856-0906 UTC) the crew got orders to shut down the gyrodynes. The station came in a so called free drift and from there the attitude had to be corrected by steering jets. These events caused a decrease of electrical power due to bad orientation of the solar batteries towards the sun. So for some hours the crew had to restrain power consumption. Next day's radio traffic revealed that the situation was almost under control. The crew worked hard to make another Omega sensor operational and doing so they met a lot of problems with the deployment of cables. Jerry Linnenger: In contradiction to the beginning of his mission contacts of Jerry with the American consultative group at TsUP Moscow could not be monitored for some weeks. 1997 April 3 - . Mir News 352: Progress-M34 - . Nation: Russia. Program: Mir. Flight: Soyuz TM-25, STS-81 Mir NASA-3. The launch of this freighter from Baykonur is on schedule for 6.04.1997 at 1904 UTC. If this start will take place and the flight to the Mir complex will be successful docking can be expected on 8.04.1997 at abt. 1730 UTC. Progress-M34 has to deliver new supplies of fuel, oxygen, water, food and repair materials. Progress-M34 will also bring 2 spacesuits for spacewalks (EVA's) of a new type. Originally the Russians planned to have a new Antares transmitter (for communications via the geostationary satellite) ready for the flight with Progress-M34, but possibly they cannot make that and that means that this transmitter will be delivered at Mir by the shuttle Atlantis in May. Mir-routine: Mir's passes for our position take place during the night hours and in this period all communications are handled by the tracking stations in the USA Dryden and Wallops and the OKIK's in the East of Siberia. For the oxygen production the crew is fully dependent on the so called 'shashki', the lithium perchlorate cartridges. Daily they 'consume' 2 or 3 cartridges. The 2 Elektron systems could not be repaired and so the crew has to wait for new Elektrons to be delivered by Atlantis. Altair-2 (23426 - 94082A): This geostationary satellite recently still over a sub-satellite point over 95 degrees East has been brought in a somewhat higher orbit. Now the period is more than 1436 minutes. This means that the sub-satellite point is slowly moving to the West. if all goes according to plan Altair-2 will reach a position over 16 degrees West in the 26 week of May. 1st Spacewalk (EVA) Tsibliyev and Linenger: This EVA is on schedule for 29.04.1997. Mir News 353: Launch Progress-M34 - . Nation: Russia. Program: Mir. Flight: Soyuz TM-25, STS-81 Mir NASA-3. The Progress-M34 was launched from Baykonur on 6.04.97 at 16.04.05 UTC. This was according to plan. Until now (morning of 7.04.97 UTC) the flight of Progress-M34 is proceeding well. During the 4th and 5th orbit the necessary orbit corrections have been executed. If all will go as planned the Progress-M34 will dock to the aft (Kvant-1) docking port (+X axis) on 8.04.1997 at abt. 1729 UTC. Radio traffic Progress-M34: In the evening of 6.04.1997 the transmitters of Progress-M34 could be monitored in the 166, 165 and 922 mc bands between 2039-2042 UTC and 2209-2213 UTC. Radio traffic Mir: During the last nights there has been a lot of radio traffic. The windows during hours in which the crew normally is sleeping were needed badly to co-ordinate with TsUP matters regarding a lot of technical problems. Significance of the freighter Progress-M34: These days the Mir-space station goes through a very critical phase. A lot of failures harass the Mir-complex during the last weeks and in particular the problems regarding the maintenance of an acceptable atmosphere on board in fact passed admissible limits. The only way to produce oxygen is the use of the lithium perchlorate cartridges. The crew cannot use the whole available supply of these so called 'shashki' 2 or 3 of which they consume daily. The series of cartridges to which the 'naughty' one belonged and that caused a fire some weeks ago cannot be used. That means that there is only a supply for a few days. Progress-M34 has to deliver the necessary cartridges to ensure the oxygen supply until the docking of Atlantis in her mission STS-84 in May. Atlantis can also bring to Mir a replacement for the Elektron system. By electrolysis the Elektron can generate oxygen from waste water, for instance water distilled from urine. Possibly the Atlantis will also deliver a new Vozdukh, the system to absorb carbonic acid (CO2) from the air on board. This Vozdukh broke down in the night from 3 to 4 April 1997 and could not be repaired. The failure of that Vozdukh was the last one in a long sequence of set-backs. Fate of the Mir-station as a manned complex is hanging by a thread. If the docking of Progress-M34 to the complex fails the crew will have to return to Earth by Soyuz-TM25 within a few days. Docking procedure: This time there is still the possibility to execute the approach and docking in the automatic mode by the system Kurs. If the first attempt to dock in this way fails Tsibliyev has to take over and dock Progress-M34 manually by the system TORU. In 1994 the cosmonaut Malenchenko secured the continuation of the manned flights on Mir with the TORU-docking of Progress-M24. Perhaps Tsibliyev will have to take the same responsibility tomorrow. Radio traffic in the evening of 6.04 revealed that among the activities for 7.04 there would be the checking and training with TORU. Altair-2 (23426 - 94082A): During the 'snail-paced' move of this geostationary satellite from East to West she is not operational and will not be used for Mir-TsUP communications. It might be possible that Altair-2 equal to her predecessor Altair-1 has a service beacon on 11.380 GHz. If so we might be able to catch up a sign of life of this satellite before she reaches the position over 16 dgs West. .
1997 April 9 - . Mir News 354: Progress-M34 - . Nation: Russia. Program: Mir. Flight: Soyuz TM-25, STS-81 Mir NASA-3. Without problems the freighter Progress-M34 linked up with the Mir-complex. The soft docking, the so called 'kasaniye' (touch) took place on 8.04.97 at 17.30.01 UTC. The approach and docking took place in the automatic mode by the use of the system Kurs. The Progress-M34 docked at the aft (Kvant-1 +X axis) docking port. During the 1st pass of Mir and Progress-M34 (orbits 63618/34) between 1721-1726 UTC it was obvious that the approach was going on. The crew did not report many details of the approach apart from the distance: 150 M. Tsibliyev was on the alert to take over manually by the system TORU, but he met problems with the image on the screen, which he needed for that operation. In co-ordination with TsUP he even consulted the on board documentation to resolve that problem if necessary. So that what I could derive from radio traffic did not convince me that the approach was successful. Moreover LOS for my position was 4 minutes before the actual docking. During the next orbit (63619 - 1856-1903 UTC) it was obvious that the docking had been successfully accomplished: of the 2 hatches between the Kvant-1 and Progress-M34 the crew already had opened the hatch on the side of Mir. They had to wait with the opening of the Progress-M34 hatch until the airseal checks had been completed. The next orbit everything had been opened and the crew already had deployed an air hose between the 2 objects. The mix of the oxygen coming from Progress-M34 with that of Mir did not give any problems. Mir-routine: So for the time being the exploitation of the Mir-space station as a manned complex has been secured. Now there are sufficient lithium perchlorate cartridges to ensure the oxygen production until the arrival of Atlantis in May. Progress-M34 delivered a lot of spare parts and reparation material , but whether these are sufficient to do something on the defective Elektron oxygen machines is not sure. Let us hope that there is now enough material to do something on other defective and faltering systems. The failure of the CO2 absorption filter Vozdukh emerged less than a week ago so it is unlikely that the Russians were able to deliver with Progress-M34 anything for the reparation. Apart from the lithium perchlorate cartridges Progress-M34 brought a tank with 50 KG pure oxygen. Compliments: The Russians deserve our serious compliments for the fact that they again solved a lot of almost hopeless problems and thus made the continuation of the co-operation with NASA in the IRS Alpha precursor program possible. The history of the Russian people that suffered so much ("mnogostradal'nogo Russkogo naroda") gave the Russians the instinct to survive during the most inclement circumstances and in spaceflight they regularly proved that they know how to use that quality. 1997 April 19 - . Mir News 355: Mir-routine - . Nation: Russia. Program: Mir. Flight: Soyuz TM-25, STS-81 Mir NASA-3. Immediately after the opening of the hatches to Progress-M34 the crew began to unload the most important stuff for direct use. They used a part of the new arrived pure oxygen supply and new lithium perchlorate 'disks' for oxygen production. Radio traffic revealed that the cosmonauts without delay had started the repair of the Elektron system in Module-D (Kvant- 2). On 11.04 this Elektron was activated, but after a few minutes during which oxygen was produced it switched itself off. On the days to follow the crew regularly worked on this system and to undo the last failure they even used a part of the unserviceable Elektron in Module-E (Kvant-1). The urgent work on the Elektron caused a considerable work overload of the crew. These days the astronaut Linenger is often deployed to assist in this repair work for which he has to refrain from a part of his American experiments. A few times the work on the Elektron had to be suspended for the execution of repair work with a higher priority. This had to do with a lot of leakage in the heating- and cooling circuits in the Base Block and Kvant-1. The leaks in the cooling loops in Kvant-1 caused the outflow of cooling liquid (ethylene glycol) and the decrease of the pressure within that circuit. A sufficient cooling is also needed for the functioning of the carbon dioxide (CO2) absorber Vozdukh. For the neutralisation of CO2 in Mir's atmosphere there is another alternative. Progress-M34 delivered for that purpose canisters lithium hydroxide. Meanwhile the Elektron in Module-D and the Vozdukh CO2 scrubber are functioning. The problems with the life support systems on board caused a high humidity and consequently a lot of condensation. Twice a day Tsibliyev can be heard reporting pulse rates, blood pressures, skin temperatures and blood oxygen saturation of all crew members. Orbit correction: Using the engines of the Pr-M34 the orbit of the Mir-station had been corrected on 15.04.19997 at 12.46.01 UTC. Apogee and Perigee changed from 397.16/381.63 KM to 402.54/389.51 KM. Solar orbit: Within a few days Mir will enter a so called solar orbit. During this period Mir will continuously remain in sunlight. Then it will be more difficult to control the on board temperatures. Tsibliyev said that physically the crew is able to sustain this inconvenience, but that he has some concerns about the equipment of the complex. 1st Spacewalk (EVA) Mir Main Expedition 23/ NASA 4: This EVA is (or possibly meanwhile: was) on schedule for 29.04.1997. The EVA will be executed if the repair work can be accomplished before a determined deadline. 1997 April 25 - . Mir News 356: 1st Spacewalk (EVA) Mir 23/NASA 4 - . Nation: Russia. Program: Mir. Flight: Soyuz TM-25, STS-81 Mir NASA-3. Vo chto by to ni stalo. This is the Russian analogue for 'At any cost'. Monitoring radio traffic during the last days I realised that those responsible for this Mir/NASA expedition decided to stick to the EVA on 29.04.97 and this made me use this expression as a sub-title for my report about that EVA. In fact I expected that the long sequence of serious technical problems and consequently the enormous strain for the crew justified the cancellation or at least a suspension of that EVA. Officially has been announced that the situation on board is almost back to normal and that the health condition of Tsibliyev and Linenger is such that they can do that EVA. The EVA is on schedule for 29.04.1997 at 0450 UTC (opening of the hatch) and will last 5 hours and 30 minutes. Using spacesuits of a new design delivered to Mir by the freighter Progress-M34, Tsibliyev and Linenger will install American experiments at the outer surface of Kvant-2 (Module-D) and the SO (the docking compartment at the Kristall (Module-T). They also will retrieve similar experiments which had been installed there in the past. Today the 'spacewalkers' trained for that EVA. In the past the preparations for EVA's started a long time before the planned date en during the last few days crews always fully concentrated on the oncoming EVA. They always got 1 or 2 days off to enable them to start the EVA as fit as possible. This time the preparations started only a few days ago and they had to use a part of the time for maintenance and repair activities. The cosmonauts are very tired and they yearn for a day off. Another problem during this EVA is the communications infrastructure. There is no Luch available. Altair-2 is still moving to the West and not operational at the moment. In the very beginning when there were no geostationary satellites available for Mir-TsUP (or: Salyut - Zarya) communications Russia had a fleet of tracking ships all over the world. Of this fleet only 4 ships are left, 2 of which are operational, but they have to remain in St Petersburg until there are means for exploitation. It is true that TsUP has the possibility to use Dryden and Wallops in the USA and Oberpfaffenhofen in Germany, but that is not enough to fill up all the gaps in the infrastructure. Telemetry monitoring during EVA's is essential. If all goes well Tsibliyev and Linenger can be heard while they are on their way back to the airlock of Module-D during Mir's orbit 63941 between 1000 and 1030 UTC on 29.04. During a short interview with an American radio station Linenger on 23.04.1997 told, that they had a rough time, but that they succeeded in restoring the situation almost back to normal and that they all were doing fine. About the leakage of the cooling system in Kvant-1 and the eventual influence of ethylene glycol on the health of the crew he said that the effects in the long run are still unknown. Solar orbit: In my MirNEWS.355 I suggested that the next period in which the Mir- complex would remain permanently in the sun was to begin in a 'few' days. This was an error. The next solar-orbit period will be in the first week of June. 1997 April 29 - . Mir News 357: 1st Spacewalk (EVA) Mir 23/NASA 4 - . Nation: Russia. Program: Mir. Flight: Soyuz TM-25, STS-81 Mir NASA-3. This EVA passed of successfully and without problems. Tsibliyev and Linenger opened the hatch of the airlock of Kvant-2 on 29.04.1997 at 0510 UTC and closed this after the EVA at 10.08.30 UTC. Duration: 4 hrs 57 mins and 10 secs. The cause of the slight delay is still unknown. The fact that the EVA lasted much shorter than the planned 5 hrs 30 mins was no indication that they had been forced to return earlier but they just accomplished their tasks well within the duration which had been foreseen. These tasks consisted of the installation of the OPM (Optical Properties Monitor) at the outer surface of the SO (docking compartment at the Kristall module). Having this done they moved by the crane Strela to the Kvant-2 where they retrieved the American experiments PIE (Partial Impact Experiment) and the MSE (Mir Sample Experiment). These experiments will be brought back to earth by the Atlantis in May this year. The last task was the installation on Kvant-2 of the Benton Radiation Dosimeter. This instrument will measure the intensity of the radiation between 51.6 dgs North and 51.6 dgs South. The areas between these latitudes will be covered by the IRS, which will orbit in the same inclination (51.6 dgs) as Mir. During the first pass for our location in orbit 63941 (0958- 1010 UTC) the EVA was in its final phase. The both 'space-walkers' already were in the airlock, which they had entered at 0930 UTC. During radio windows they worked with tranquillising music in the background. Radio traffic revealed that Tsibliyev and Linenger had a lot of fun and acted fully relaxed. The EVA was successful and they did not meet any problems. The new type of the Orlan DMA spacesuit was used for the first time and during the pass in orbit 63942 (1133-1145 UTC) Tsibliyev reported his satisfaction about the improvements. He told that his good experience with this spacesuit during training in the hydrolab now has been proven in practice. The suit is very flexible, and especially the gloves are very good: it is much easier to use your fingers. And Tsibliyev has the right to judge this for he did 5 EVA's during his mission in 1993. During the EVA Lazutkin remained on board where he watched the systems, made films of his colleagues, helped them with advice and communications. If the present good luck of the Mir exploration will not vanish Lazutkin will do 2 EVA's together with Tsibliyev during this Mir 23d Main expedition. Admiration: All those responsible for the achievements of today: the crew, but also the flight control and consultative groups in Korolyov and Houston deserve our admiration for the way in which they showed their skill and this example of excellent international co-operation. They had the courage to execute this difficult operation just a week after a long period in which the operational life of the Mir space station was hanging by a thread. Let us entrust the work on future space flight projects in their hands! 1997 May 11 - . Mir News 358: Mir-routine - . Nation: Russia. Program: Mir. Flight: Soyuz TM-25, STS-81 Mir NASA-3. The successful spacewalk (EVA) gave the crew the elixir they badly needed. In the period after the EVA the lion's share of the activities had to consist of the preparations for the arrival of Atlantis on mission STS-84 on 17.05 (wind and weather permitting). Of course they do a lot in this respect, but repairs and the struggle to restore failing systems almost overtax the cosmonauts. They had to replace a number of essential parts of the SRV-U (the system for regenerating water from urine). Also the system SRV-K, to make water from condensation had to be mended. A few days they had to spend a lot of time on the 2 KOB-systems. One of those systems showed a repeatedly pressure decrease. They needed a pressure hose for the repair and tried out some hoses they found. At last they connected one that fitted and solved the problem by the separation of both systems. They postponed the search for the leaks in the KOB-1 and 2 and the cooling loop in Kvant-1 until after the departure of Atlantis. For the co-ordination of all activities and to get the necessary advice from TsUP all VHF-windows are needed and used. They also communicate via Dryden and Wallops in the USA and Oberpfaffenhofen in Germany, even during holidays. Sometimes a failure emerges spontaneously during VHF-conversations. For instance 11.05 during the pass in orbit 64127 at 0639 UTC TsUP ordered Tsibliyev to switch off the cycling of the solar panels and when he did so the SOI (possibly the system for orientation and stabilisation) stopped. The reserve system (SOI-2) immediately took over. During the last days special attention had to be paid to the movements- (attitude-) control systems. The external thruster in the Sofora mast (VDU) has been used, possibly to take care for the stabilisation during a reset procedure for the gyrodynes. Preparations for the arrival of Atlantis: Especially Jerry Linenger is very busy with the selection and the arrangement of that what he has to deliver on Earth. The Russians also do so with the help of checklists. The main bulk of cargo for return consists of samples and software of experiments, but there is also a lot of defective and used equipment and parts of systems. Altair-2: This geostationary satellite (23426 - 94082A) accomplished its walk from 96 dgs East to 17 dgs West, but did not make a stand. To stabilise the satellite over the calculated sub-satellite point (between 16 and 17 dgs West) the VKS (Russian Space Forces) have to correct the orbit such that the period will become 1436 minutes ) on day 128 the period was still 1438 minutes. Mission STS-84 Atlantis: The main purpose of this mission is the delivery of Mike Foale and the relief of Jerry Linenger for return to Earth. As soon as Mike Foale's 'seat liner' has been transferred to Mir (in fact via Mir to Soyuz-TM25) Mir mission will get the designation Mir23/NASA5. If, wind and weather permitting, Atlantis will blast off on 15.05 the following schedule can be used: Launch 15.05 at 0808 UTC, opening hatches 17.05 0428 UTC. Undocking 22.05 at 0405 UTC Landing 24.05 at 1153 UTC. 1997 May 25 - . Mir News 359: Chronicle - . Nation: Russia. Program: Mir. Flight: Soyuz TM-25, STS-81 Mir NASA-3, STS-84, STS-84 Mir NASA-4. Just before the beginning of Atlantis mission STS-84 I left my 'station' for a badly needed vacation. For those who use my 'MirNEWS-series' as a chronicle I decided to draft a short summary of that mission. The information therein I derived from different sources. Atlantis STS-84 mission largely accomplished successfully: Launch Atlantis on 15.05.97; flawless docking with Mir on 17.05.97. Michael Foale relieved his colleague Jerry Linenger. 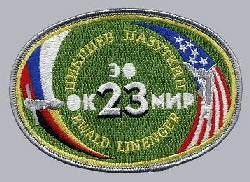 Mir's mission will be named : Mir 23 / NASA 5. Both crews succeeded in transferring mutually all what had to be transferred within the 5-day period. Adding a 6th 'docking day' was not needed. Mir was plentifully provided with an extra supply of water and oxygen en the replacement equipment and spare parts to postpone for a very long time the definitive termination of the ageing space station. The most important equipment for that purpose was the new oxygen machine Elektron, which had to be installed in the Module-D (Kvant-2). The old Elektron which had been repaired some weeks ago and has been operational in Module-D has been reinstalled in the former spot in Kvant-1 to be used as a reserve. The delivered supply of oxygen enables the crew to refrain for a long period from the use of the Elektrons. Defective equipment, for instance the old Elektron, which could not be repaired, has been brought back to earth for analysis. Originally there has been a plan to deliver a new Antares transmitter for communications via the geostationary Altair-2 (now in position over 16 degrees West). Information about this plan is still unclear and even sometimes contradictory. Communications: During the combined flight the communications also to and from Mir had been handled to a large extent via the American TDRS-facilities. Mir communicated directly with tracking stations on Russian territory using VHF frequencies. After the launch of Atlantis on 15.05 Eileen Collins could be heard on 259.7 mc between 0826 and 0829 UTC when she via a tracking station in Spain reported the 'power down of the APU'. Shortly after the stabilisation of Altair-2 over 16 degrees West there has been word that the satellite had a transmitter failure and that the Russians would do all what was possible to reactivate this transmitter. Due to my absence I was not able to monitor 10.830 Ghz. During my stay in Budapest I met a 'colleague' and he told me that he received somewhat like a 'wide band' signal on that frequency, probably a test signal by the VKS (Russian space forces). This was on 19.05. Later on and until the afternoon of 21.05 the transponder transmitted a continuous carrier without modulation. Another colleague in Western Europe monitored the wideband signal and recorded this. Meanwhile there came some information about the Antares transmitter on board Mir. The installation of a new Antares has been put back until the arrival of a needed part which has to be delivered by Progress-M35 (launch 22.06, docking 24.06). Conclusion: Altair-2 is operational. The problem is still on board Mir. Mir-routine: The 3 crew members on board Mir again have to do the job alone. Just before the arrival of Atlantis they repaired the defective water regeneration systems (SRV-K condensation and SRV-U urine) . Before a profound analysis on Earth of the quality of the water regenerated by the SRV-K they are not allowed to drink this water. They are satisfied about the new supply of oxygen and the relative high pressure of the atmosphere on board: 780 mm. One of the first priorities is the search and elimination of a leakage in the cooling loop VGK. The passes of the Mir-station for our position take place during the night hours. So for a short period there will be not much radio traffic via VHF unless something special happens during these night hours. I will remain on the alert! 1997 June 12 - . Mir News 360: Progress-M35 - . Nation: Russia. Program: Mir. Flight: Soyuz TM-25, STS-84 Mir NASA-4. This freighter is on schedule for late this month. If launch and flight will go as planned Progress-M34 will have to leave the aft docking port (+X-axis) the day before the arrival of Progress-M35. Apart from the normal cargo a badly needed component for the Antares-transmitter on board Mir has to be delivered by Progress-M35. Until the restoration of Mir's satellite relay system audio and video downlinks will be limited to ground station passes. Progress-M34: It might be possible that before the departure for decay in the Earth's atmosphere the Russians will execute an autonomous flight with the old freighter to test the TORU system. Thus far no confirmation about this operation. Radio-amateurism: The fact that the Mir-crew is active again on the radio-amateur-frequencies confirms that the situation on board though not fully back to normal, improved to such a degree that they got more time to relax. During almost every pass within our range the amateur station in the 145 mc band is active, mostly in Packet Radio, but also in Phone. Mike Foale (call KB5UAC) or the Russians (R0Mir) can be heard on Mir's downlink 145.800 mc. (uplink 145.200 mc). The crew transmitted a P/R message in which they said that they planned to increase P/R traffic. In another P/R message they reported that the Safex-2 transponder in the Priroda Module is operational again. Downlink is 437.950 mc, uplink 435.750 mc. To open the transponder a CTCSS tone of 141.3 hertz is needed. During docking operations with Soyuz-TM- and Progress-M ships and Shuttles Safex-2 will be OFF to avoid interference on crucial systems. 1997 June 16 - . Mir News 361: Progress-M35 - . Nation: Russia. Program: Mir. Flight: Soyuz TM-25, STS-84 Mir NASA-4. If all goes according to plan this freighter will be launched on 27.06.1997 at 0630 UTC. If launch and flight will be successful Progress-M35 will dock at Mir's aft docking port (X-axis) on 29.06.1997 at abt 0748 UTC. There are no plans for an autonomous flight with Progress-M34. If during the first day of the flight of Progress-M35 all goes well Progress-M34 will separate from Mir on 28.06.1997 and brought on a destruction course for decay over a designated area in the Pacific East of New Zealand. As requested by radio-amateurs in the USA the 'downlink frequency' of the VHF station in Mir's base block has been changed from 145.800 to 145.985 mc. This change took place on 15.06.97. Almost during every pass within our range traffic, mainly Packet Radio, can be monitored. During the last days Foale could be heard in Phone. Foale is a skilled radio-amateur with a very good memory. During a QSO with the Belgian amateur ON6GP he remarked that during mission STS-45 ON6GP spoke with Foale's crew mate the Belgian astronaut Frimaut. Tsibliyev and Lazutkin during every pass discuss their reparation activities. They meet a lot of problems with cables and contacts which they cannot find or do not fit. Undoubtedly the present mission, teased by a lot of problems and set-backs, is leaving its traces on the psychological stamina of Tsibliyev and Lazutkin. Especially for Tsibliyev it is not always easy to maintain his normal flexibility. In a long conversation with his father Foale told that he just flew over England. The British isles were fully overcast and the cloud layer had the same shape as the country itself. He also told that Tsibliyev and Lazutkin badly hope that the relief crew will be launched at abt. 8.08.97. The Russians will be relieved by Solovyov and Vinogradov. After the departure of the present crew Foale will remain on board Mir. So he will be a member of Mir's Main Expedition nr. 24 (Solovyov and Vinogradov) for a period of appr. 7 weeks. Chris v.d. Berg, NL-9165/A-UK3202. 1997 June 25 - . Mir News 362: Progress-M34 - . Nation: Russia. Program: Mir. Flight: Soyuz TM-25, STS-84 Mir NASA-4. guidance from inside Mir). The fact that departing Progress-M-ships could be used for that purpose had been announced, but I could not get confirmation about the possible use of Progress-M34. Radio traffic during the last days revealed that Tsibliyev had got orders to check the TORU-system during an autonomous flight of Progress-M34. He and Lazutkin repaired electronics of the TORU and TsUP told Tsibliyev what he had to do. The manoeuvres should be executed during those periods in which Mir would be in range of ground stations. undocked from Mir on 24.06.97 at 10.22.50 UTC. Just after undocking Progress-M34 flew above the Mir-complex and a few hours later Tsibliyev reported that Progress-M34 flew behind Mir in a distance of appr. 2 KM. Progress-M34 had to be redocked at Mir with the use of the system TORU on 25.06.1997 between 0920 and 0925 UTC. THIS DOCKING ATTEMPT FAILED. When this report 'went to press' specialists at TsUP were analysing the situation and whether or not -and if so when- a second attempt would be made had not been decided yet. 1997 June 26 - . Mir News 363: The following message received from VideoCosmos - . Nation: Russia. Program: Mir. Flight: Soyuz TM-25, STS-84 Mir NASA-4. Novosti Kosmonavtiki June 25, 1997 -- Moscow, Russia -- Progress M-34 cargo vehicle collided With the Spektr module of Mir space station earlier today but the crew survived. The collision occurred before 09:18 UTC during Progress' fly around in remote control mode before scheduled re-docking. The crew haven't had communications with Russian ground stations at the time. The cargo spacecraft sheared a half of Spektr solar panel and made damage to the module itself. Depressurization of the station had begun but the crew succeeded in fast closing the hatch to Spektr. The rest of the station is being re-pressurised. Also, thermal control radiators on Spektr were damaged. There is no immediate danger to the crew but emergency landing is a possible decision. This report is not copyrighted. If you plan to use or publish the report please keep reference to VideoCosmos Co. of Moscow, Russia, and Novosti Kosmonavtiki Magazine. 1997 June 27 - . Mir News 364: Progress-M34 - . Nation: Russia. Program: Mir. Flight: Soyuz TM-25, STS-84 Mir NASA-4. The Russians abandoned the plan to finish the existence of this freighter today. Progress-M34 is still needed for Telemetry analyses, necessary for the investigations on the cause of the 'mini-catastrophe. For the time being it is extremely difficult to get a reliable picture of that what happened due to the huge amount of versions and rumours about the failed docking attempt. When Progress-M34 will enter the earth's atmosphere and decay has been not decided, it might take place on 28 or 29.07.97. Intentions and options known up to now (27.06.1997 1200 UTC): A lot of press-releases speak about the necessity to make a spacewalk (EVA) for the inspection and eventual repair of the little gap or crack in the hull of Module Spektr. Such an EVA will certainly be executed, but this will take place not before the arrival of the next cargo ship Progress-M35. The first EVA will be a so called 'internal EVA' using the transition section (P.Kh.O.) as an airlock via which the cosmonauts can enter the Spektr. Module Spektr: For a long time this module was the 'base and home' of the American astronauts. In this module Foale disposed about a lot of equipment and experiments. The crew has to determine what still is available and can be saved and what is lost. For the time being a lot of experiments cannot be executed and in fact the experimental program for this expedition is almost fully suspended. One of the 4 solar panels of Spektr has been severely damaged, possibly beyond repair. The other 3 might be able to deliver power, but due the disconnection of cables, some of those cables had even to be cut in two, they are out of order. The damaged one and one of the other 3 are badly needed for power supply for the whole complex. The event caused a power reduction of appr. 50% . Before I spoke about a little gap or crack and not as generally is done in publications about this damage, about a gap, or even big hole. If it would be a real gap the crew would be dead. Depressurization would have been a matter of seconds not only or the Spektr but also for the whole complex. This depressurization was in fact a process which passed off slowly. The crew felt the decrease of the pressure in their ears and they had still enough time to close one of the hatches to Spektr and -possibly we will hear about this later- do a lot of things before closing that hatch. Situation on board of Mir : A summary about the developments after the collision as derived from the enormous amount of radio traffic will be published in NEWS.365. 1997 June 28 - . Mir News 365: Radio traffic after collision Progress-M34 with MIR. - . Nation: Russia. Program: Mir. Flight: Soyuz TM-25, STS-84 Mir NASA-4. On 25.06.1997 during the first pass of the daily sequence (orb. 64831, 1049-1054 UTC) it was obvious that something went terribly wrong. If the redocking would have been a success this should have been obvious during this traffic. No word about the Progress-M34. The only subjects about which the crew spoke with TsUP were the systems on board Mir. In the first place they had problems with the SUD (attitude control) and something had happened with a module. TsUP transmitted a long series of 4-digit groups and the crew got orders to record and to collate them ('kvitantsiya'). In the next pass (orb. 64832, 1223-1232 UTC) reports about serious problems indicating that the complex had suffered from a heavy blow. An emergency signal warned that the power supply was too low (tension too low), that storage accumulators could not be charged and that the attitude of the complex had been changed and flew on its side. One or more of the 5 still available solar arrays could not be adjusted for a good angle towards the sun.. Tsibliyev reported that they were unable to change this and that the complex had a movement along the X-axis. The crew got orders to activate the direct TV-link (commands Anna-72 and Anna-86) and to send images. Mike Foale made this images with a camera. (These images could be seen all over the world during the rest of the day). Very alarming was that what the crew reported during the 3d pass (orbit 64833, 1359-1409 UTC). Those solar panels which were still available could not be adjusted via computer commands, but this had to be done manually by the cosmonauts. The gyrodynes did not work any more , the electrical tension was too low and the Ts.V.M.-1 (the main computer) ceased to function. The SUD failed and this was also the case with such a system in Module-D. After reporting all these calamities Tsibliyev stated that the situation was very bad. A number of ventilators did not work and the crew was grateful about the fact that the ventilators in Module-D functioned normally. The fact that the gyrodynes stopped and did not consume power anymore decreased the burden on the power supply. After a long discussion about the power problems the crew got permission to adjust the solar panels of Module-D manually for a better angle towards the sun. In the background the voice of the veteran cosmonaut Vladimir Solovyov, Head of Flight Control, could be heard. As much as necessary the crew could use the Soyuz-TM25 and in case of a failure of the communications from the Base block they could use the transceiver of that ship. The traffic during the 4th pass (orb. 68434, 1535-1546 UTC) began with the cheerful voice of Foale asking Tsibliyev how he felt himself. Tsibliyev said that he was very tired and suffered from strain caused by the event. Before LOS TsUP gave the windows for communications via the ground facilities of Oberpfaffenhofen, Dryden en Wallops in the coming night. 1997 July 1 - . Mir News 366: Radio traffic in the period 26.6 - 1.7.1997 - . Nation: Russia. Program: Mir. Flight: Soyuz TM-25, STS-84 Mir NASA-4. During this period it was for me a relief when I during the first pass of the daily sequence heard the voices of the crew. Every conversation between the crew and TsUP referred to the difficult situation and their 'struggle for life'. 26.06: Just like on 'collision day' they again had to do everything to adjust those solar-arrays which still were operational to the best angle towards the sun. The absence of the gyrodynes for the movements control and the absence of the possibility to have commands executed by computer programs means that the crew has to adjust the solar arrays manually. One of the complaints was that the solar arrays on Module D moved very slowly. Nevertheless the angles towards the sun gradually improved leading to an increase of power supply. The crew did all what was possible to determine the damage by observations and making images via several portholes, but it was impossible to get a full picture. For the reception of radiograms the RTTY system was in use again. The attitude control of the complex was executed by thruster jets, also with those of the transport vehicle Soyuz-TM25. They did not do any experiments for which electrical energy was needed and all radio-amateur activities had been suspended. For the filtering of the air from CO2 now and then the Vozdukh scrubber was activated. 27.06: This day there was word about a gyro-stabilised orientation, possibly with the attitude control of the Soyuz-TM25. For the neutralisation of CO2 TsUP wished the use of lithium hydroxide canisters. Tsibliyev asked permission to do this with Vozdukh. At first they had to do this with those canisters, but later on they got permission to switch on Vozdukh for a while. The crew also worked on the Elektron, but this oxygen producer had to remain switched off to economise energy. During the pass in orb. 64863 there has been a TV-link (Anna-72 and Anna-86) and possibly they used for the phone during these communications the VHF-2 130.165 mc. During the pass in orb. 64865 the crew answered questions of a lady on earth. The crew said that only a few experiments ('sleep' and the 'orangery') can be executed. During this interview the possibility of a spacewalk (EVA) was mentioned. Tsibliyev spoke about an 'internal' EVA. Tsibliyev hoped that their spacesuits will enable them to enter the Spektr. He stated that the present situation is far from hopeless. Problem is that 1 solar array has been severely damaged. The other 3 solar arrays on Spektr are still in good order, but it is a 'bloody shame' that they cannot deliver electrical power. One of those 3 is badly needed for the power supply. The lady asked how things are looking inside the Spektr. Tsibliyev said, that they do not know this for they have not been inside. In his opinion a space station can be compared with a 'test firing range' where everything is possible. They are very proud of their Mir. Cosmonauts are prepared to undergo normal and emergency situations, even those which have not been foreseen. But together with the experts on earth they always will 'twist themselves out'. 28.06: Today again attitude corrections with the thrusters of Soyuz-TM25. Also a few times TV-links. The work on the Elektron has been postponed until next Monday, probably due to a valve that cannot be opened. Later on they spoke about the functioning of the Elektron in Kvant. (37KE). Today the transfer of radiograms with Packet Radio could be monitored. A lot conversations about the 'internal' EVA. The equipment needed for this EVA has to be transferred from the Sh.S.O. (airlock of Module-D) to the P.Kh.O. (transition section, which again has to function as airlock). They spoke about the spacesuits, POV, BSS and so on. 29.06: During passes they almost exclusively spoke about the next EVA and also mentioned the spacesuits which have to be used: Orlan-M or Orlan-DMA. Foale is also involved in the solution of these problems. It was also obvious that a part of the available gyrodynes is functioning normally. Now and then they speak about the switching off of one gyrodyne or the use of a reserve. 30.06: Again a lot about the EVA. There was also work to do on the cooling loops VGK and K.Okh-B in Kvant (37KE). 1.07: Foale spoke with Wendy Lawrence, his successor. He says that his 'little room is in vacuum now'. Meanwhile the radio-amateur Packet Radio transmissions on 145.985 mc have been resumed. (this means that the power supply situation really improved) During the pass in Orb. 64925 Tsibliyev reports: 'At about 1100 UTC we heard some dull claps or knocks. It was not clear what it was. When we at 1103 UTC entered the light from the shadow we saw a big cloud of very little white flakes near the Module-O (Spektr). Obviously there is fuel leaking away from somewhere'. He asked TsUP to check the fuel tanks by Telemetry. 1997 July 2 - . Mir News 367: Progress-M34 - . Nation: Russia. Program: Mir. Flight: Soyuz TM-25, STS-84 Mir NASA-4. This naughty boy (or is it girl?) ceased its existence on 2.07.97 at 06.32.00 UTC. Progress-M34 burnt up over a designated area in the Pacific East of New Zeeland. During the autonomous flight until decay specialists used Progress-M34 for tests in the framework of the investigations in the cause of the fatal event on 25.06.1997. The launch of this new freighter with a partly replaced cargo is on schedule for 5.07.1997 at 04.11.54 UTC. If all goes according to plan the Progress-M35 has to link up with Mir's aft (+X) docking port on 7.07.1997 at 05.58.15 UTC. The original cargo has been partly replaced by equipment needed for the activities in relation to the Module Spektr during an internal spacewalk . With Progress-M35 an Antares transceiver for communications between Mir and TsUP via the geostationary satellite Altair-2 over 16 dgs West will be brought to Mir. After MirNEWS.366 went to the 'press' there was still a pass of Mir in orb. 64927 in which Lazutkin reported that they did not see those flakes after their first observation. The morale is excellent. Tsibliyev regained his old flexibility and he is very busy with the very complicated preparations for the internal EVA (so in fact an IVA) which possibly will be executed in the night from 11 to 12.07.1997. 1997 July 7 - . Mir News 368: Progress-M35 - . Nation: Russia. Program: Mir. Flight: Soyuz TM-25, STS-84 Mir NASA-4. The start of this cargo ship from Baykonur took place on 5.07.97 at 04.11.54 UTC. During the pass in orb. 2, 0847-850 UTC, the Telemetry transmissions in the 166 and 165 mc could be heard and during the pass in the next orbit these transmissions, but also those of the beacon in the 922.755mc could be monitored. On 6.07.1997 during the passes in the orbits 18, 19 and 20 good signals on all frequencies and with the doppler shift on 922.755 mc 2 times TCA's could be determined: 071751 and 085100 UTC. Progress-M35, approach and docking: Again all went of old: a stable and reliable execution of this operation by the automatic system Kurs. The docking took place on 7.07.1997 at 05.59.24 UTC. During Mir's orbit 65015 from 0549-0554 UTC the approach was going on. At AOS the Progress-M35 was in a distance of 147 M. Tsibliyev reported very little deviations in the course and attitude of Progress-M35. There was a stable GSO (gyrostabilised orientation) and all went so successful that Tsibliyev could load some date, given him by TsUP, in a computer. Just before LOS the distance was still 120 M and the approach was continued with a speed of 30 cm\sec. During the next passes they did not speak about the opening of the hatches to Progress-M35. The main subject was the good functioning of the gyrodynes, the good attitude of the complex and the fact that the solar arrays had been turned to a good angle in relation to the sun. The accumulators could be fully charged. The crew has to remove temporarily the spacesuits from the P.Kh.O. (transition section) to get more room for the transfer of goods from Progress-M35 to the rest of the complex. The Russians deserve a heartfelt 'Molodtsy' (well done fine fellows). But please let those responsible for Russian manned spaceflight as soon as possible make a deal with the Ukrainian factory Khartron for the restoration of the delivery of the system Kurs. In that way docking-operations can be executed with a 99.99% reliability!! Chris v.d. Berg, NL-9165/A-UK3202. 1997 July 11 - . Mir News 369: Progress-M35 - . Nation: Russia. Program: Mir. Flight: Soyuz TM-25, STS-84 Mir NASA-4. In contrast with the normal practice after dockings this time the crew had to wait with the opening of the hatches until the next day to conserve power and to enable the crew to have a good night's rest. The subjects discussed during radio communications in the passes in the first 3 orbits after the docking had nothing to do with the arrival of the Progress-M. They spoke about the replacement of water tanks, the switching on and off of the Elektron for oxygen production and the work on the accumulators. They had problems with the BKV-3 (air conditioning) and something was wrong with the Vozdukh, the CO2 scrubber. The next day the crew got permission to open the hatches and to start the unloading and loading of the freighter. They immediately began to pump water into the tanks of the complex. Foale had seen his 'goodies' for which he had been anxiously waiting, but due to the congestion of goods he could not yet reach them. This week radio traffic revealed circumstances which did not get much attention in the press and status reports. Everybody is aware of the fact that the module Spektr is as dead as a doornail, but the power shortage also paralysed another 2 huge modules, i.e. Kristall and Priroda. Greatest anxieties causes the module Kristall. Near the docking device for the Space shuttle (the SO, docking compartment is attached at the Kristall) the high humidity causes a lot of condensation and there but also in other places Foale and Lazutkin try to absorb this water as much as possible using towels. Foale reported that the temperature in Kristall is abt 4 a 5 degrees Celsius. Tsibliyev told TsUP that he blew air into Kristall for warming up. The most important subject remained the preparations for the coming spacewalk (IVA). The lion's share of this work is in the hands of Tsibliyev. When this report went to press there was not yet a complete scenario for the IVA. This meant that Tsibliyev regularly has been confronted with changes. This also in relation to the equipment and tools which they must have at hand during the IVA. Tsibliyev asked for a definitive list of all what has to be put in the IVA bag. Thus far he several times had to replace things. He also urged TsUP to avoid unnecessary delays. Now and then TsUP and the crew discuss the collision. Foale and Tsibliyev repeat much what they have told earlier. TsUP is still trying to trace the spot where Spektr's hull has been perforated. TsUP asked Lazutkin to give his opinion based on that what he heard during the collision. He told where he heard the hissing (or: sizzling, Russian word 'shipeniye'). When you should enter the module this must be in the wall on the left hand side. At first the blow was at the radiator, which is installed between the 2d and 3d plane. In the nearest (seen from the place where Lazutkin was) 'quarter'. If that is the place of the fixation at the suspension obviously the puncture must be there. During the period just after the collision Foale had his quarters in the P.Kh.O. (transition section). This P.Kh.O. will serve as airlock during the IVA and so Foale had to remove. He is now living in the module Kvant-2 (Module-D), which certainly will be more comfortable than the P.Kh.O. During this week the gyrodynes did not function continuously: sometimes all of them of just 1 were spun down for power conservation and in these periods for attitude control the small thruster jets of Mir and (now) the Progress-M35 are used. Chris v.d. Berg, NL-9165/A-UK3202. 1997 July 15 - . Mir News 370: Spacewalk (IVA) - . Nation: Russia. Program: Mir. Flight: Soyuz TM-25, STS-84 Mir NASA-4. The preparations for the internal EVA were still going on successfully (as far as this can be ascertained by monitoring) when Tsibliyev reported that he had hearth rhythm problems. Initially he discussed this with a doctor, first name Irina, who was not able to diagnose the case and so she did not prescribe medicine. Later on Tsibliyev asked for permission to swallow a pill and for an answer on his question whether he would be able to do the difficult IVA or not. The problem emerged yesterday and now it is known that higher 'doctors' are trying to find a solution. During radio conversations in the passes of orb. 65141 and 65142 it was obvious that the complaints of Tsibliyev will effect further plans. The exercise which was on schedule for today (using Kvant-2 to imitate the IVA into Spektr) had been put back and that this was also the case with the IVA itself. Today Tsibliyev declared that if he could have a week to recover and nothing special would occur he wished to do the IVA himself. From the beginning, for instance during the collision , he was so involved in this all that he considers this as his duty. TsUP obviously had other ideas and asked Foale to take the microphone. Foale stated that he had no objections and that he would be very pleased to accomplish this task. He was sure that Tsibliyev would give him the right instructions. Tsibliyev possibly agreed with the possibility that Foale would replace him. Foale added that he already knows how to handle the spacesuit Orlan-DMA. Tsibliyev said that the spacesuits were ready for the operation. A few orbits later Mir communicated with TsUP via Altair-2 in phone, but they also exchanged images. For a long time the cosmonauts were in the P.Kh.O (transition section) involved in technical preparations for the IVA. Tsibliyev was the most active crew member during these preparations and did not show signs that he had health- or stress problems. Probably he wants to recapture his place as spacewalker nr. 1. Whether Tsibliyev or Foale will do the IVA is not yet known. The IVA has been put back abt 10 days. Foale did not participate in the discussions from the P.Kh.O. Now and then, but not often, Lazutkin could be heard. The crew succeeded in restoring the communications from and to Mir via this geostationary satellite. Initially they had problems with their phone during the transmission of TV-images. On Sunday (13.07) they showed little papers with that what they wanted to tell their relatives and friends. On 14.07 they adjusted the installation in which Foale substantially participated. Today, 15.07, the so called Ku-band was fully in use during some passes. Chris v.d. Berg, NL-9165/A-UK3202. 1997 July 20 - . Mir News 371: Cable trouble - . Nation: Russia. Program: Mir. Flight: Soyuz TM-25, STS-84 Mir NASA-4. By accident one member of the Mir crew disconnected a cable connection between a rate-sensor in Module Kristall and the SUD (attitude control computer), which caused a troublesome chain reaction of system failures. Among the systems which did not work anymore were also transmitters in the base block, the UKW-1 transceiver and Telemetry transceivers. So for communications, but also for an alternative attitude control the crew had to use the systems of the fully autonomous Soyuz-TM25. During the night hours I use to record transmissions using a time switch. In the morning I did not find anything on my tape and during the pass in orbit 65171, 0548-0559 UTC, the 143.625, 145.985 and the 166/165 mc telemetry transmitters did not show any sign of life. I checked whether they used Altair-2 or not: again negative. A few minutes after the pass Geoff Perry told me that he had heard them on 121.750 mc. During the next pass they still used the 121.750 mc during which Geoff Perry heard them laughing in reaction on that what TsUP had said. The first pass in which the 143.625 mc was in use again was during orbit 65173 at 0900 UTC. Tsibliyev reported that there has been some recharging of the accumulators again and consequently they had switched on some systems, i.e. the UKW-1 transmitter and Telemetry transceivers. In the early morning of 18.07 I was on duty during the nightly passes. During 2 of them (in orb. 65184 and 65185) all service frequencies remained silent, but I had a hope that conditions had improved for on 145.985 mc there were Packet Radio bursts again. During the pass in orb. 65186 Tsibliyev kept watch in the Base Block and he confirmed that the situation was better than the day before. His 2 colleagues still slept which they badly needed because of the fact, as Tsibliyev stated, they had to endure so much during the last days. During the passes still to follow he also slept and the only sign of life was the continuous rattle of Packet Radio. My oscilloscope did not give any indication that Altair-2's downlink was active. The first windows in which VHF-traffic could be monitored here before the early morning hours of 19.07 and as my body was longing for a good night's rest I adjusted my time switch so that during all windows a recorder was active. And of course this time not only for the 143.625 , but also for the 121.750 mc. After a night in which I slept like a log I found a recording of the transmissions on 143.625 mc during the first pass in orb. 65199 (0045 UTC). Lazutkin had the middle watch in the Base Block and he reported good results of the recharging of accumulators and the fact that there was GSO-1 (gyro stabilised orientation), a very slow rotation and the complex flew on one side. Later on Lazutkin was in his couch and only the Packet Radio and Telemetry transmitters were active. During orbit 65203 Altair-2 showed up again. A signal on 10.825 GHz and on the monitor images of floating cosmonauts, the interior of the Base Block and now and then a glimpse of the damaged Spektr. Also phone in which Foale told that he has to use a list with things he needs for the IVA and components for the Orlan-DMA suit. This list in Russian and he asks for an English translation to make it easier for him in contacts with American experts during training for the IVA and the IVA itself. Chris v.d. Berg, NL-9165/A-UK3202. 1997 July 22 - . Mir News 372: Decisions taken - . Nation: Russia. Program: Mir. Flight: Soyuz TM-25, STS-84 Mir NASA-4. The present crew has been relieved from the task to do the IVA. The announcement was published on 21.07, but contacts between Mir and Earth, for instance in a conversation between Foale and Frank Culbertson made this clear. Another indication was the fact that the preparations for the IVA had been suspended. Foale said that he was a little disappointed for he personally was hoping to do that work, but he thinks it is the right decision politically but also for this crew. Solovyov and Vinogradov will be launched on 5.08 and dock on 7.8.97. Then the present crew has just a week for the transfer of the station. They will return on 14.08.97 in their Soyuz-TM25. At first Foale did not know what to do with himself when he heard of the postponement, but they have been so very busy in the last 2 months that it is good to have some rest and the possibility to get back to the routines. Foale's opinion is that his role is changed, for he is there no longer for science, but to help them and to learn and whatever. He values the recent experience. Without the power on the modules you cannot say you are doing active science. If you under these circumstances are saying you are doing the science you would not be telling the truth. He will do all what is possible, for instance with the greenhouse and he will be very busy with towels to absorb condensation water from the walls in the modules. This French spacionaute will not join the crew of M.E. 24. It would have been senseless, but also irresponsible. He will get the opportunity to fly with a later expedition. This operation will take place not before 20.08. Before the IVA Solovyov, Vinogradov and Foale will make an autonomous flight with the Soyuz-TM26 to redock this ship from the aft port (+X-axis) to the P.Kh.O. port (-X-axis). During the IVA Foale will be in the Descent Module of Soyuz-TM26 to activate the BO (life compartment) of that ship as an airlock if Solovyov and Vinogradov cannot get airseal in the P.Kh.O. for instance if the new hatch to Spektr is not airtight. After the restoration of the power situation of the day before the accident with a computer contact. Altair-2 has been used for TV-contacts, phone, data transmissions and the exchange of service radiograms with Packet Radio. Foale has now time to speak with radio-amateurs via 145.985 mc. He made also contacts with some European amateurs. Via Packet Radio he issued the following status report: Subject: Status: I am having frequent power problems with tnc, and loosing all msgs. Sorry. No supply store is near at hand. I would do anything for a 9 pin serial adapter. Getting ready for next crew, August 7th Mike, KB5UAC. Chris v.d. Berg, NL-9165/A-UK3202. Mir News 373: Routine - . Nation: Russia. Program: Mir. Flight: Soyuz TM-25, STS-84 Mir NASA-4. After the announcement of the postponement of the IVA the whole crew showed a great disappointment that they would not do that. But immediately it was obvious that the mood on board was much better. Though 10 days ago they energetically and skilfully worked on the IVA preparations they possibly shrank from the task itself. Many Americans expressed concern about the question what the crew would have to do during the period until their relief. Apparently they thought there on would be an idling bunch of cosmonauts on board. This is not true at all: Foale immediately started to fulfil that part of the experimental program for which he does not need the Spektr module: the greenhouse, the study of crystal structures, the beetle experiment and earth observations. And he himself is there: he can continue medical and psychological experiments. He told his American colleagues that the cooled modules Kristall and Priroda attract moisture from the rest of the complex and that the greatest condensation appears in these modules. Tsibliyev and Lazutkin are now able to concentrate on the preparations for their return and to continue in a more relaxed way maintenance- and repair work of the life support systems. Using air ducts and ventilators Lazutkin blew warm air into the Priroda module and dried this module as much as possible. In a conversation with Mark at TsUP Foale praised Lazutkin for that what he had achieved. The drying of the Priroda made it possible to use it to stow away the hard- and software for the French Pegase expedition and for material and spare parts for the life systems of the complex. Tsibliyev is again fully in command and presents himself in the way I still remember from his flight in 1993/94. This geostationary satellite is in use regularly , more than Altair-1 in the past, but in view of the fact that 16 windows a day might be possible, they use this possibility relatively seldom. Altair-2 enables the crew to have longer conversations with controllers and experts on Earth. Especially Foale extensively uses this opportunity. The satellite is also in use for the exchange of video images and data to Earth. Obviously the use of the transceiver on board for these communications is limited due to cooling demands. The transceiver and the Elektron have the same cooling loop. Not always the full window for communications via Altair-2 is used. This was the case on 27 and 28.07. It is still unknown who is to blame for this incident. The incident took place during a training for the IVA. During the real IVA this cable has to be disconnected to make it possible to close the hatch between Kristall and the P.Kh.O. So this disconnection must have been mentioned in the timetable for the IVA. I wonder whether or not there was anybody in TsUP who had to monitor the activities of the crew and to warn them not to disconnect that cable, because this was an exercise and not the real thing. Head of Flight Control Solovyov shouted: 'This is not a kindergarten'. Whom did he cry to: the crew or the people with him on Earth? Chris v.d. Berg, NL-9165/A-UK3202. 1997 July 31 - . Mir News 374: Soyuz-TM26 - . Nation: Russia. Program: Mir. Flight: Soyuz TM-25, STS-84 Mir NASA-4. The launch of this ship with on board a crew of 2 for Mir's Main Expedition 24 is still planned for 5.08.1997 at 1535 UTC and if launch and flight go according to plan the docking will take place on 7.08.1997 at 1723 UTC. This time deviates from the normal routine to dock only a few minutes after LOS for the first pass for our position. This time the docking will take place almost 20 minutes later possibly to enable Solovyov and Vinogradov to make a video and/or photo survey of the module Spektr for damage assessment and to see whether Spektr is not the only module that suffered from the blow on 25.06.97. Recently there have been suggestions that there might be more damage than had been supposed initially. On 6.08.1997, so 1 day after launch of Soyuz-TM26 the freighter Progress-M35, meanwhile fully loaded with trash , will leave the aft (Kvant +X axis) docking port for a 10 days lasting autonomous flight. On 7.08 Soyuz-TM26 has to dock at that port, but after the departure of Soyuz-TM25 with the relieved crew on 14.08.97, Soyuz-TM26 with on board Solovyov, Vinogradov and Foale have to redock at the forward (P.Kh.O. = -X axis) port as soon as possible. This is scheduled for 15.08.97. They can fly around, but also wait until the Mir complex has made a turn of 180 degrees around the Z-axis. After redocking the Russians have to accept another challenge for already on 16.08.97 Progress-M35 has to redock at the aft (+ X axis) port. This time again in the automatic mode with the reliable system Kurs. There will be no time to recover from the sustained strain for the crew will have to deal with the preparations for the IVA on 20.08.97. If this IVA will be awarded by success TsUP can give green light for an EVA (so a real external one) on 3.09.97 for an inspection of the outer surface of Spektr. On 145.985 mc Packet Radio could be monitored in which Foale gave the following Mir-status report: TNC frozen again, this time the PMS. Waiting for a replacement with Mir 24, Anatoliy and Pavel, docking on the 7th. Crew is preparing for their arrival, getting Progress loaded with trash, to be undocked before next crew. Greenhousing, but not yet showing cotyledons. Mike. Chris v.d. Berg, NL-9165/A-UK3202. 1997 August 6 - . Mir News 375: Soyuz-TM26 - . Nation: Russia. Program: Mir. Flight: Soyuz TM-25, Soyuz TM-26, STS-84 Mir NASA-4. The perfect launch took place on 5.08.1997 at 15.35.59 UTC. On board the crew for the 24th Main Exp. to Mir, Anatoliy Solovyov and Pavel Vinogradov . Call sign: Rodniki, so Rodnik-1 and Rodnik-2. During the first pass in orb. 2 (1838-1841 UTC) very weak signals on beacon- and telephony frequencies. During the pass in orb. 3 (2007-2011 UTC) very good reception on all frequencies. Solovyov could be heard in a conversation with TsUP. He reported a technical anomaly in the BO (life compartment): a hose (or: tube) was not connected to an air purification unit, which caused an increased amount of CO2 in the mini-atmosphere on board. He told TsUP that he had connected that hose immediately and that the system was functioning normally. Again good signals in the window in orb. 4 (2138-2147 UTC) during which Solovyev repeated his report about that hose. 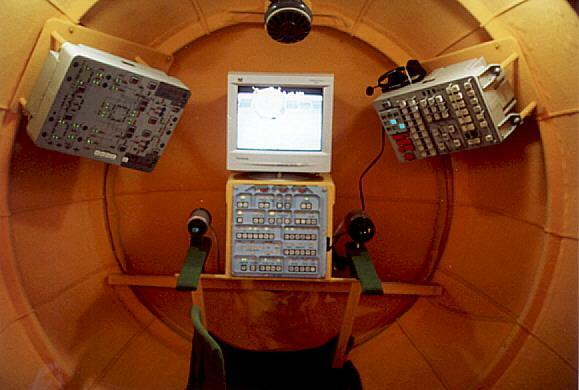 During the passes in the evening of 4.08.1997 the crew reported that they were working on the malfunctioning Elektron oxygen generator in Kvant-1. (The Elektron in Kvant-2 is not operational due to power shortages). During a long communication session via Altair-2 in the morning of 5.08.1997 the crew was still co-ordinating the repair work on the Elektron. After the departure of Progress-M35 for a 10 day lasting autonomous flight lithium perchlorate cartridges have to be used for the production of oxygen. This will be not very convenient during the period in which 5 men are on board (7-14.08.97). An eventual delay of the Soyuz-TM26 launch due to the problems with the Elektrons has not been taken into consideration. In MirNEWS.374 I gave an estimated time for the docking of Soyuz-TM26 on 7.08.97 as 1723 UTC. In that report I remarked that this time considerably deviated from the normal routine: dockings a few minutes after LOS of the first pass of both objects for our position. Inquiries in the Ballistic Section of the Keldysh institute of the R.A.N. learned that there had been a misprint in a Russian message about the estimated docking time. The estimated docking time is: 07.08.97 at 1703 UTC, so in accordance with the normal routine. The supply ship Progress-M35 has to free the docking port (+X-axis) for the arrival of the Soyuz-TM26 and will do this on 6.08.97 at 1144 UTC. The autonomous flight of Progress-M35 will last until 16.08.97. On that day Progress-M35 will dock (in the automatic regime with the system Kurs) at the same docking port after the redocking of Soyuz-TM26 to the forward (-X-axis) the day before. Chris v.d. Berg, NL-9165/A-UK3202. 1997 August 8 - . Mir News 376: Soyuz-TM26 - . Nation: Russia. Program: Mir. Flight: Soyuz TM-25, Soyuz TM-26, STS-84 Mir NASA-4. This transport ship docked at the aft port of Mir on 7.08.1997 at 17.02.08 UTC. During the docking operation communications took place via Altair-2. The approach was in the automatic mode with the system Kurs. When Mir and Soyuz-TM26 came within my VHF-range Solovyov could be heard reporting distances, approach speeds and deviations in course. Everything went perfect until appr. 1700 UTC when a slight upward deviation forced Solovyov to take over manually. The 'Kurs' failure did not get much attention due to the euphoria after the 'successful' docking. The hatches swung open during the pass in orb. 65507 at 1832 UTC. Normally this is a smooth and orderly procedure but this time there were some problems with the TV-link. Cheerfully both crews met each other. During the pass in orb. 65508, 2006-2013 UTC, TsUP and Solovyov discussed the conservation of the Soyuz-TM26 and some technical items. The session was concluded by the transfer of radiograms from Earth to Mir by Packet Radio. In all passes good reception on all frequencies. In a conversation with someone on Earth Vinogradov told that he somewhat suffered from space sickness during the first flight day and in the morning of the 2d one, but after eating somewhat substantial he recovered and was now feeling well. Progress-M35: This supply ship undocked from Mir on 6.08 at 11.46.45 UTC. Thus far Tsibliyev and Lazutkin did not succeed in repairing the Elektron oxygen generator in Kvant-1. There are some options to solve the problem: 1. With a spare part to be delivered by Atlantis in September, or 2. to try to find a way to deliver power to the Elektron in the now curtailed module Kvant-2. For the time being oxygen has to be generated by the heating of lithium perchlorate cartridges. Not so convenient with 5 men on board. (as far as known at deadline for this report) : Return of Tsibliyev and Lazutkin with their Soyuz-TM25 on 14.08.1997. (In my opinion a return of the relieved crew as soon as possible due to the oxygen problems would be a logical decision). The redocking of Soyuz-TM26 with on board Solovyov, Vinogradov and Foale from aft to forward docking port (P.Kh.O.) on 15.08. 1997. The return and docking in the automatic mode (Kurs) of Progress-M35 at the aft docking port on 16.08.1997. Chris v.d. Berg, NL-9165/A-UK3202. 1997 August 14 - . Mir News 377: Soyuz-TM25 - . Nation: Russia. Program: Mir. Flight: Soyuz TM-25, Soyuz TM-26, STS-84 Mir NASA-4. This ship separated from on 14.08.97 at 08.55.58 UTC and flew away at 09.01.57 UTC. The return capsule (S.A.) of Soyuz-TM25 made a safe landing on 14.08.97 at 12.17.10 UTC at a distance of appr. 160 KM S.E. of Dzjeskazgan in Kazakhstan. The landing took place later than estimated and CNN did not bring the landing as 'live event'. For a long time TsUP could not give the exact spot where the S.A. came down. The radio traffic in which the farewell ceremony took place, and in which the relieved crew went on board Soyuz-TM25 and closed the hatches took place via the facilities of White Sands and Wallops in the U.S.A. and the tracking stations in the East of Russia. When Mir and Soyuz-TM25 entered daylight at abt. 1118 UTC communications with TsUP were established via Altair-2 in which Mir relayed traffic from and to Soyuz-TM25 via Altair-2 to TsUP. At abt. 1122 UTC Tsibliyev reported the beginning of the de-orbit burn. He reported continuously the results of the impulses in meters/sec and at 1126 UTC he said that the de-orbit burn had stopped. He went on reporting details of the descent process and at 1145 UTC he announced the separation of the BO (life compartment) and the instrument/motor module from the SA (descent module) in 3 minutes. This took place at 1148 UTC just before the 3 objects entered the dense layers of the atmosphere. The BO and Instrument/motor block burnt up and the SA came in the plasma wave. Radio contact ceased and contrary to previous return flights did not come back via Altair. The voices of the men on board Mir could be heard. Foale said that he had seen the Soyuz-TM25 disappearing below them. Altair-2 was switched off at 1201 UTC. Plans for tomorrow (15.08): Redocking of Soyuz-TM26 with on board the 3 crew members of Mir from the aft to the forward docking port. After undocking from Mir Soyuz-TM26 will hover and wait until Mir turned 180 dgs so that the forward (P.Kh.O.) port will be in front of Soyuz-TM26. During this operation lasting from abt. 1322-1410 UTC the crew will carry out an extensive photo- and video observation for damage assessment. Progress-M35: As far as known at deadline for this report Progress-M35 will redock at Mir's aft docking port on 17.08.97 at abt 1330 UTC. (So not as suggested in previous reports on 16.08.1997). Landing of Soyuz TM-25 - . Return Crew: Lazutkin, Tsibliyev. Nation: Russia. Related Persons: Lazutkin, Tsibliyev. Program: Mir. Flight: Soyuz TM-25, Soyuz TM-26, STS-84 Mir NASA-4. Following a mission that seemed to consist of an endless series of collisions, breakdowns, fires, and other emergencies, the EO-23 crew handed over the station to EO-24 and on August 14 entered Soyuz TM-25 landed in Kazakstan at 12:17 UTC, 170 km SE of Dzezkazgan. The Soyuz landing rockets failed to fire on touchdown, giving one of the roughest landings experienced by a returning Mir crew.